Nine boys and 16 girls topped the Manila Regional Selection Camp of Jr. NBA Philippines 2018 presented by Alaska to join the roster of Jr. NBA All-Star aspirants from Bacolod, Baguio and Butuan that will move on to the National Training Camp on May 18-20. 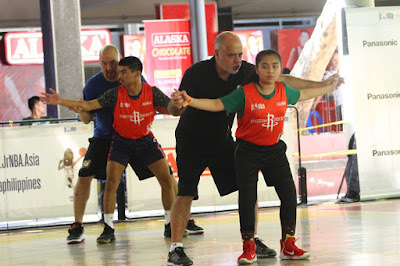 More than 800 players joined the NBA’s global youth basketball program at Don Bosco Technical Institute in Makati on April 21, which sent 50 boys and 32 girls to return on April 22 for advanced drills and team scrimmages. The second day witnessed the selection of the outstanding performers that also exemplified the Jr. NBA core S.T.A.R. values of Sportsmanship, Teamwork, a positive Attitude and Respect. Jeremy Gabriel Felix, 14, of Ateneo de Manila University; Joshua Minguillo, 13, of Anorama Montessori Binan; Lionel Matthew Rubico, 13, of De La Salle Lipa; Raphael Tolentino, 13, of International School of Better Beginnings; Kim Aaron Tamayo, 13, of National University; Rhon Khaniel Telles, 13, of St. Anthony de Carmelli; Robert Janus Torres, 14, of Victorious Christian Montessori; Dranreb Aeron Singson, 14, and Rodelio Tomas, 14, of Escuela de Sophia Caloocan are representing the boys division. In addition, the girls division is comprised of Yza Camila Shalea Alarcon, 14, New Era High School; Franzelle Angela Chelzea Besa, 14, of Divine World College of Calapan; Franchesca Isabela Buenvenida, 11, of Mother of Divine Providence School; Merylle Angelica Cuasay, 12, of Adriatico Memorial School; Jay Anne Marie Lachica, 12, of Sta. Clara Parish School; Erika Nadine Tenorio, 12, of School of the Holy Spirirt Quezon City; Justine Valdes, 13, of Saint Pedro Poveda College; Ghemrie Hashley Garcia, 13, and Valerie Ruth Mapalad, 13, of Child Jesus of Nazareth School, Arianne Amber Esquivel, 14, and Kyla Marie Mataga, 13, of De La Salle Zobel; Juliana Yap, 13, and Marielle Vingno, 14, of Escuela de Sophia Caloocan and Maria Juliana Abella, 13, Isabela Louise Gonzales, 12, and Aaliyah Mai Reyes, 12, of Saint Paul College Pasig. The finalists from the National Capital Region, chosen by the Jr. NBA evaluation committee led by Jr. NBA head coach Carlos Barroca and PBA Legend Jeffrey Cariaso of Alaska, will have a chance to vie for the 16 Jr. NBA 2018 All-Star slots and be rewarded with an overseas NBA experience trip with fellow Jr. NBA All-Stars from Southeast Asia later this year. For more information on Jr. NBA Philippines presented by Alaska, fans can follow Jr. NBA on Facebook at www.facebook.com/jrnbaphilippines. For all things NBA, fans can visit www.nba.com, like the NBA on Facebook at www.facebook.com/philsnba and follow www.twitter.com/nba_philippines on Twitter.